Selling tickets? Mule Deer Foundation charges a small service fee of 2.0% + $.50 per ticket. Most event hosts choose to add the service fee to the ticket price so buyers pay slightly more for the convenience of purchasing online and there's no cost to you. The service fee is per ticket sold so if you don’t sell any tickets you won't be charged. Offering free tickets? There's never a service fee on free tickets. Accepting donations? There's no service fee on donations, although payment processing fees will still apply. Use a Stripe account to collect funds from your ticket sales. 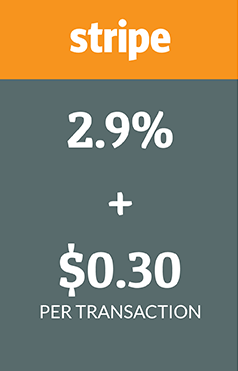 When you use Stripe payment processing, they will charge 2.9% + $.30 per transaction. However, you have the option to add the processing fee to the ticket price so buyers pay slightly more and there's no cost to you. After funds clear in a few days, they are deposited in your bank account. Any Mule Deer Foundation service fees are automatically deducted before your funds are transferred. No monthly fees. No setup costs. No hassles. Free events get free service! If you're not charging your event attendees, we won't charge you either. You won't have to set up a payment account or enter any financial details. PayPal applies their own fee, outside of Eventgroove. It will usually be from 1.9 to 2.9 percent of the total transaction amount plus $0.30. If you want to recover this cost, you will need to mark up your ticket price.